The National Havurah Committee (NHC) is a network of diverse individuals and communities dedicated to Jewish living and learning, community building, and tikkun olam (repairing the world). For almost 40 years, the NHC has helped Jews across North America envision a joyful grassroots Judaism, and has provided the tools to help people create empowered Jewish lives and communities. The NHC is nondenominational, multigenerational, egalitarian, and volunteer-run. The havurah movement in general, and the NHC in specific, is not a “denomination” for several reasons. First of all, there is no one central institution with which havurot affiliate. The NHC is an organization that provides resources and networks to grassroots Jewish communities, but does not have any formal category of congregational affiliation. Some havurot are affiliated with various denominational movements or with synagogues, and many are independent. Second of all, since the set of all havurot is extremely diverse (and their participants are even more diverse), there is no unifying consensus among havurot about the specifics of Jewish belief and practice. Havurot are unified instead by a participatory ethos of Jewish community, in which everyone has something to teach and everyone has something to learn, and everyone has a role in creating the community. 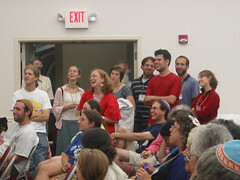 The NHC’s flagship program, the week-long Summer Institute, is a unique opportunity for serious study, moving prayer, spirited conversation, late-night jam sessions, singing, dancing, swimming, meditation, and hiking — all in the company of more than 300 people from a wide range of backgrounds. Each year participants leave the Institute reinvigorated and excited to return to their home communities to share new ideas and experiences. One of the NHC’s greatest strengths is the diversity of its participants. We are musicians, doctors, students, furniture makers, retirees, Jewish professionals, homemakers, teachers, activists, and just about everything else. At past Summer Institutes, our youngest participants have been under 6 months old and our oldest over 80, with many participants from all age groups in between. 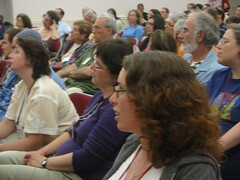 We are Jews from birth, Jews by choice, people committed to both traditional and non-traditional Jewish practice, non-Jews, and people exploring Judaism; LGBT and straight; people of color, Sefardi, Mizrachi and Ashkenazi; urban, rural, and suburban; Conservative, Orthodox, Reconstructionist, Reform, Renewal, secular, and Jewish without labels; and people with no formal Jewish education, people with Ph.D.’s in Talmud, and people with all other types of Jewish backgrounds. The dynamic process of exploring together what Judaism and Jewishness means in our lives is a highlight of the Institute. At the Summer Institute, every teacher is also a student and every student is also a teacher. People who are usually called “rabbi” or “professor” throughout the year go by their first names here. And people who rarely take active leadership roles in their communities discover that they, too, can teach and contribute to the community. One participant summed it up when she wrote after attending her first Havurah Institute: “The Havurah Institute was slightly closer to heaven on earth than other places I’ve been before. It was a week of learning, singing, dancing, talking, thinking, and feeling…You could make friends with anyone regardless of age or affiliation. It was a place full of individuals and families of all ages, shapes, colors, orientations and interests, united by a love of learning and teaching and a desire to make Judaism a positive force in their lives.” We look forward to creating community with you at the NHC Summer Institute!